Good morning, everyone! Hope y'all got lots of rest and are holding a freshly brewed cup of coffee as you read. If you have been following for any length of time at all, you know all about my crazy love of coffee. I don't get a lot of sleep, and I depend on the caffeine boost to get me through the day. I know many of you are in the same boat. Now, all you coffee drinkers out there know what it's like to have to add some nasty, powdered, off-brand, non-dairy, unflavored ugliness in little paper packets to your coffee. We've all done it, and none of us have enjoyed it. It's enough to ruin your whole day! I like my coffee "light and sweet", so creamer (usually half and half, or whole milk) is always on my grocery list. 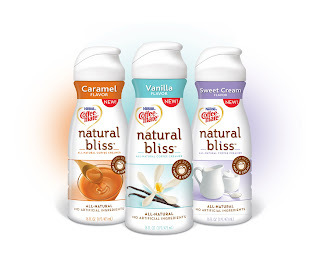 Because of the level of my coffee love, you can imagine how thrilled I was to be contacted by Coffee-mate to review their newest line of liquid creamers, Natural Bliss! Made with real milk, cream, sugar, and natural flavors, this isn't powdered ugliness. I know how difficult it is to find gluten free options for our strict diets. 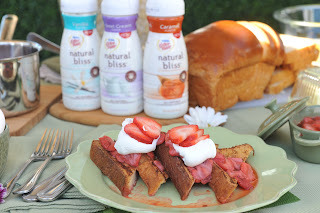 But guess what~ all flavors of Natural Bliss are not only gluten free, they are also kosher. And because they use sugar instead of corn syrup, there's no need to worry for those of us with corn allergies, either! This newest addition of products to the Coffee-mate family has made such an impression that Claire Robinson, who hosts Food Network's 5 Ingredient Fix, came up with a French toast recipe using the Sweet Cream flavor and it was featured in Family Circle magazine! Check out her recipe here. In fact, there are oodles and gaboodles of great recipes on the Coffee-mate website . Nestle' Coffee-mate was the first non-dairy creamer to transform an ordinary cup of coffee into a rich, creamy, every day delight. Coffee-mate was introduced to us as the world's first powdered creamer in 1961, and soon established its position as America's most popular choice. Over the past decades, Coffee-mate has transformed how consumers enjoy their coffee through the introduction of new flavors, seasonal flavors, and reduced fat, fat free, and sugar free varieties in both powder and ready-to-drink liquid. Today with more than 20 flavors, Coffee-mate continues to reinvent, redefine, and recreate each coffee drinker's perfect cup. And now, the fun part! 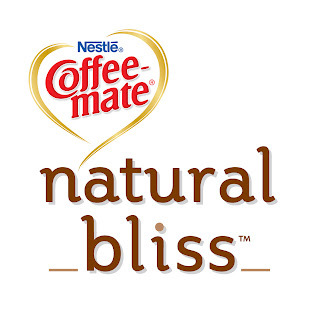 TEN Living with Logan readers can win a free bottle of Coffee-mate Natural Bliss in the flavor of their choice (Sweet Cream, Vanilla, or Caramel)! However, due to differing state laws, readers residing in the states listed below will not be eligible for this giveaway, and that just makes me sad. I was provided with coupons for free products to review. I was not compensated in any other way! This review contains my own observations and opinions. I was not paid to feature this post. Nasty powdered creamer packet image by Google images. Let the fun entering begin!